There are several options for parking in and around downtown Knoxville. Many garages and lots are free on weeknights and weekends. You&apos;re heading downtown for a Vol football game. Or a concert at the Tennessee Theatre. Or First Friday happenings. You know there&apos;s going to be a big crowd. Where should you park? There&apos;s now a new digital tool available that can help you strategically pick your parking garage destination, before you even start your car and pull out on the road. 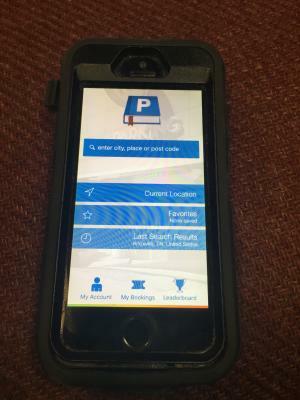 Parkopedia.com offers a free phone app that reports data from sensors at the entrances to City-owned downtown garages. So you can see, in real-time, how many parking spaces are available at each garage. If State Street Garage or Market Square Garage is full, you&apos;ll know to head to the Locust Street Garage, or the City County Building Garage - or park at the Civic Coliseum and ride the free KAT trolley to downtown and Old City destinations. You can download the app onto your phone, or get the information off a desktop computer. Learn more on how the app works or visit Parkopedia.com or download the Parkopedia app. Enter "Knoxville" where prompted to enter a city or place.